Because no matter which of these you choose, it’s wrong! This ideology goes against everything which seven-eighths of the world’s population believed in at the time when this hideously evil-concept was introduced to the planet. That was during the time of the Old-Testament and it’s only grown more terrible since the day it became the unwritten law for all mankind. The majority of men that live today, according to this code from that ancient time, created the circumstances which Israel stands for today. Every person on the planet came from a woman, how then can it be ‘natural’ or right to “Declare War on Women”? Because “Nature” and Women must be “Conquered”! Conquest, War, Famine & Death represent their idea of the beginning and the end of all life on the planet—and that’s wrong! This blatant-lie stands against what seven-eighths of the global population believed-in at the time. It’s also why today’s imitation-Jews want to eliminate the bulk of the planet—because they know IF overwhelming numbers in the population today actually understand the truth behind this false imperative—then Israel will be revealed for what it is and that realization will require the absolute abolishment of Israel and their imitation-powers forever. “While the message delivered by the whole image is one of an overwhelming power and darkness that dwarfs the blood red sun, the keys are there within the images to their very real demise and can be clearly seen in the details. That’s why I painted this seven foot circle, so the world could see the lies that are killing us. CONQUEST - His upper body is armored in gold & silver but in his left armpit the symbol of chaos is born. His right shoulder guard is feminine and in the corrosion of the left guard rests the masculine. The stone glove that carries the flag brings a volcano in mid-eruption. The massive armor seems impressive but it's too heavy and too thick to allow to the figure to exercise its full potential, in fact he cannot bend the arm that holds the bow, and his grip upon symbolic power prevents him from using the bow for anything but show. On his chest are the Seven Seals of Saint John, the breaking of the first-four of which is what 'Revelations' says; has created these other-worldly visions. On his saddle horn sits Golem, wrapped around the fragile-blue world that it intends to destroy. Further down, his thighs have turned to stone, and on his shin guard the Phoenix has awakened. His hob-nailed boots cannot contain the secret that they tried to hide ­ because his 'feet-of-clay' are beginning to explode. WAR - His shield is decomposing from the heat of the destruction of the Burning Flag of All Nations. As in life, this invalid shield is being dissolved from the bottom up. At the center of his shield is the all too human-pawn of war, composed of back-to-back humans. The hilt of his weapon is made from the severed head of an Eagle. 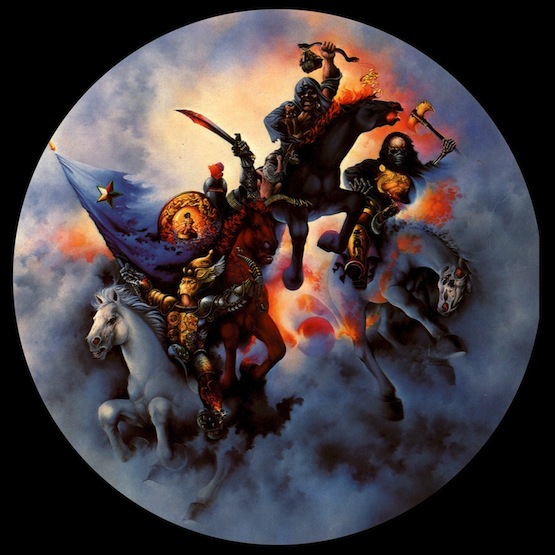 But the key to his destruction lies in the three clenched fists that forever-blaze atop his helmet and represent the chaos that always fights itself, that War always hurls among all nations. FAMINE - Sometimes called Pestilence and frequently stands for plagues of all kinds. His success will guarantee his failure, just as soon as we allow him to end the race of human-beings altogether. The staving children cling to him. His scale of balance hangs from the double-ended serpent on which money outweighs food and therein lies the ugliest of truths’ for the world today. 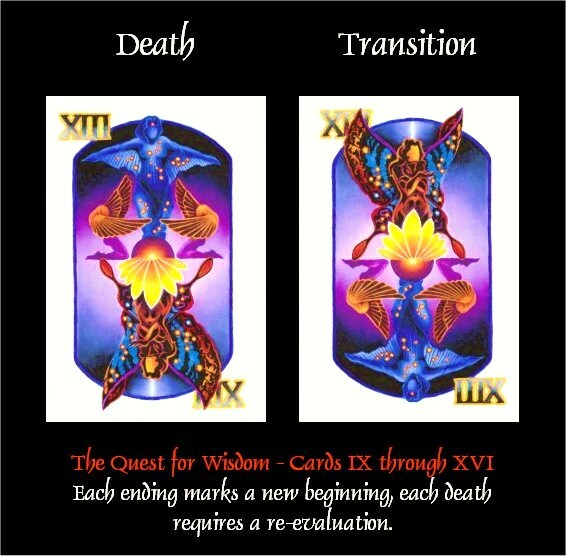 DEATH - This figure has always been a major part of Life. His cloak is held by a golden sundial that indicates the value that his presence lends to Time. A pair of Egyptian Funeral Vultures decorate his breast-plate, and his shin guard carries a totem image of Ancient Egypt's Four-Most-Important things. On his saddle-horn the red-head tries valiantly to stop the passage of time, to no avail. His upturned boot reveals the hated blade that comes with violent endings. The face-plate for his horse is made directly from the skull of his trans- parent mount, but Death's presence is constant in all that everyone must undergo so there will always be a physical end to everything that humans undertake, including all of Cheney's WARS! Above is another form of Death that speaks of other truths. 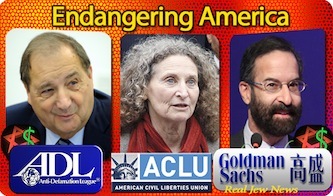 What Americans fail to understand is that Ashkenazi Jews and the global-outlaws of the world have hidden themselves well, in order to insert themselves throughout this society - to end the United States and feed us all to their particular lusts which the Four Horsemen still represent today. This is NOT about religion: This is about an ideology so evil that it had to conceal itself in cloaks of many colors in many nations to escape discovery, until they could be as falsely-powerful as they have become today. See the link below the following article for 6 ways to end it! And they are because we’re about to see them for who they are! “WHILE JEWS ARE TRAMPLING America under their feet, they’re actually crying ‘victim’ while our country bleeds. The Image can be enlarged by clicking on it.